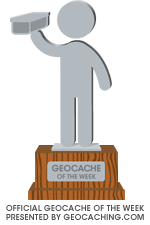 You'll have to look for the "right place" to sign your name searching for the hidden GEOCACHING LOGO!!! You'll need a Pen or similar to log it and to use the magical numbers 4-5-2 (if the cache was recently muggled the numbers may be changed but you can always find them ON SITE). There is no space for any TB or coin! Please advice when the logbook is going to be full. Consider a poor GPS signal due to the particular place (about 10 meters with our Garmin). Dear Geocachers, the Major of Verona would like to apply a Ticket of 2 Euro to visit the Juliet’s House and The Courtyard with the Balcony. This measure is NOT YET ACTIVE, BUT IT COULD BE PROBABLY SOON OR LATER... SO HURRY UP). In 14th century Verona the two families of Montagues and Capulets were fighting one against the other... well, the rest of the story is well known. What not everybody knows is that like in many legends, also in Juliet and Romeo's (ladies first in Italy) story there is something true. The two families, Montecchi and Capuleti in Italian, the struggle for power that took place in Italy and in Verona at that time, the Scala family lords, are all true. 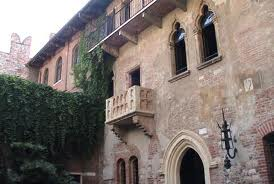 In Verona there are still the houses of the two families, nowadays of course called Romeo's house and Juliet's house, with its famous (but restored or post-produced) Balcony. The story was already popular in 14th century and there are at least three versions, written by Italian authors. Shakespeare version was part of a trend among writers and playwrights of the time to publish works based on Italian novellas. At the time of Shakespeare's Romeo and Juliet, Italian tales were very popular among theatre patrons. Critics of the day even complained of how often Italian tales were borrowed to please crowds. Shakespeare took advantage of their popularity, as seen in his writing of both All's Well That Ends Well and Measure for Measure (from Italian tales) and Romeo and Juliet. Shakespeare's version is an adaptation of the Italian Giulietta e Romeo, by Matteo Bandello. Bandello's story was translated into French and was adapted by Italian theatrical troupes, some of whom performed in London at the time Shakespeare was writing his plays. Although nothing is known of the repertory of these troupes, it is possible that they performed some version of the story. Bandello's version too was an adaptation of Luigi da Porto's Giulietta e Romeo. The latter gave the story much of its modern form, including the names of the lovers, the rival families of Montecchi and Capuleti, and the location in Verona. Da Porto is probably also the source of the tradition that Romeo and Juliet is based on a true story. The names of the families (in Italian, the Montecchi and Cappelletti) were actual political factions of the thirteenth century, mentioned by Dante in a short verse of his Divine Comedy. Juliet's House (Casa di Giulietta) is located in Verona and is reputed to be the house where Juliet Capulet (immortalised in Shakespeare's Romes and Juliet lived. Although scholars have long since dismissed the idea of this being Juliet's home (if, indeed, she existed at all) this has not stopped it from becoming one of the major tourist attractions in Italy. The house is located at Via Cappello, 23 in Verona. It dates back to the 12th century and was owned by the del Cappello family for many years and the similarity of their name to Capulet helped promote the idea that the house was the home of Juliet. The family's coat-of-arms can still be seen on the keystone of the inner archway in the courtyard. The house itself was built in the 13th century and a major restoration in the 1930s added windows, gothic doors and the famous balcony. However, some dispute that the balcony was added saying it was merely renovated and had always been there. In the courtyard is a large bronze statue of Juliet by Nereo Costantini. Although the origins of the tradition are obscure, rubbing the right breast is supposed to bring luck. Inside the house the walls are completely covered in graffiti - usually love messages - in many different languages. Every so often they are completely cleaned but the next visitors simply add more messages. Also inside is a small museum. 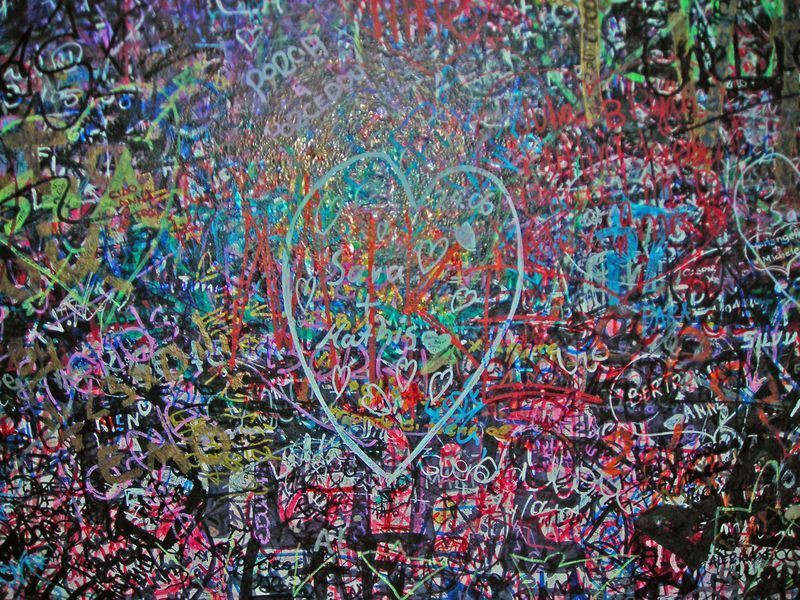 Despite the hystorical controversies regarding the place itself, the Juliet's Balcony remain one of the most visited site by Lovers from all over the World, leaving there, in many different ways, their best LOVE messages! 21 april 2013- salsafrösch - FTF!!! Ng gur onfr bs gur Cynag. Hfr 4-5-2 (vs gur pnpur jnf erpragyl zhttyrq gur ahzoref znl or punatrq ohg lbh pna nyjnlf svaq gurz BA FVGR). Sbetrg nobhg gur zhttyrf.... whfg ybt vg!! !